The Time Magazine described Pawel Pawlikowski latest movie as ‘A Terrific Smoky-Cool Love Story’, which to my mind sums up a rather splendidly enjoyable black and white Polish/French movie. 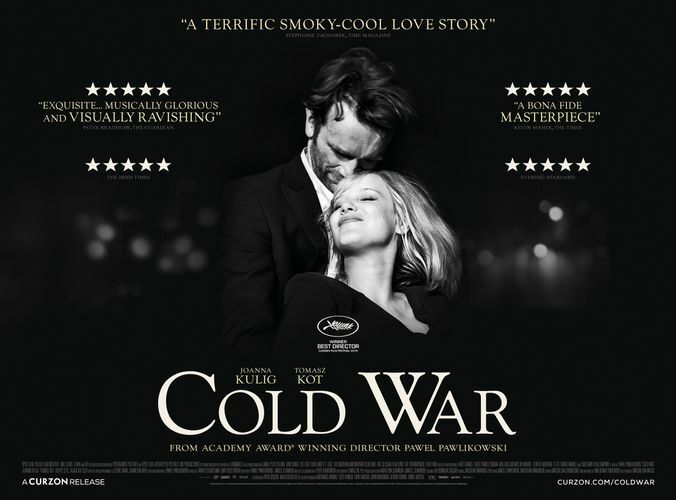 Cold War is a love story set against the backdrop of Europe following World War 2 that begins in 1949 and carries on until the 1960’s. Wiktor (Tomas Kot) first meets the attractive and rebellious Zula (Joanna Kulig who had previously appeared in two of Pawel Pawlikowski films 2011’s The Woman in the Fifth and the award winning 2013 movie Ida) when he and his assistant (Agatha Kulesza who appeared as Wanda Gruz in Ida) tour Poland collecting and recording authentic folk music and auditioning young dancers and singers to form a theatrical group to perform in the countries that form the mighty Soviet Union. Zula and Wiktor form an immediate attachment before falling obsessively in love and escaping to Paris. The movie earned the Polish director the Best Director Award at the 2018 Cannes Film Festival along side five awards at the European Film Awards including Best Actress for Joanna Kulig. If like me you have enjoyed Pawlikowshi’s last four movies his latest offering will not disappoint.